...or at least the $6 Stride Rite saddle shoes. Last year, I blogged about one of my favorite local consignment sales for children's clothes. Y'all know I don't like to mention where I live here on the blog, so I'll refer to the sale yet again as the "WW sale." I thought I'd share a few thoughts on shopping this year and a couple of photos of my finds. When it comes to an annual consignment sale (of any kind, really), the "early bird" really does get the worm. Otherwise, the other birds have picked through everything and you are left with old, stained, or overpriced grubs...or something like that. Bring something to carry your bargains in, whether it's a shopping bag, wagon, or double stroller with a laundry basket inside...don't judge me. Be sure to inspect items you pull off the rack. I'm guilty of snatching up a cute cotton romper, only to discover on my way to check-out that it has some tiny stains that the seller tried to disguise by putting a little sweater over it. Know beforehand what you are willing to spend. When I shop consignment, I expect to find a good deal. Unless it's the last day of the sale (when many items are marked at 50% off), you won't find anything at the WW sale marked less than $4. I try to hunt for pieces marked between $4 and $6. I also expect consignors to know their audience. I saw several women laugh, shake their heads, and put a lovely little Lilly Pulitzer sundress back on the rack. $26 may be a good price when comparing to a brand new LP dress for $60-$100, but generally the shoppers you'll find at a consignment sale are looking for rock bottom prices. The same goes for over-priced Gymboree outfits. If I wanted to spend $15 on a pair of cotton shorts and a matching top, I'd spend it as a "down payment" on something brand new from the store. If you're willing to spend a little time "digging," you'll be sure to find some good thrifty treasures to bring home with you. I did! If you're a local, and would like more information about the next WW sale (in April! ), please email me and I'd be happy to send you the website and sale details. Linking to Rhoda's super fun Thrifty Treasures party! Wowzers! What a huge sale! Wish we had something of the sort here. I just posted my new purse obsession that I have found hunting the thrift stores. Yep, it's 'bad' but oh so good. LOL CUTE clothes! I loved dressing mine up when they were little. I always shopped clearance or consignment. How fun is that! I love sales like that!!! My church is having a mom to mom sale next week I think. I need to get in on THAT action. I don't have anything to sell but I definitely could BUY. ;) You found some really cute things. Yay! wow what a great idea and you really found some darling outfits for your little doll. small world - my niece went yesterday, too. she lives in blackstone. i haven't heard about her deals, yet. We have a sale like that here, and I always laugh at the $26 dresses too! Are they nuts?! Personally, I don't even like to pay that much for an Easter or Christmas dress! Much less, one that's not even new. I have gotten a few good deals, but I love to go in the last few hours when mostly everything is half off. It's pretty picked over by then, but I have found some treasures! You found some darling outfits for your girls. Excellent hunting! Those clothes are adorable! And the shoes are a real score. I had to laugh at the LP dress, though. I'm amazed at how many people seem to think of children's clothing as an investment. I just don't get it. My grandmother would have said they have more dollars than sense (or cents). I love a good consignment sale, though I've found that the older my boys get the harder it is to find good stuff! I think it is because boys are so rough on their clothes! I got some great stuff for my youngest the last time I went to one though! Great finds! Sorry I've been mia all week. Things have been a little crazy around here and I'm just now catching up on reading a weeks worth of blogs! So cute and again makes me wish I had a girl to dress! 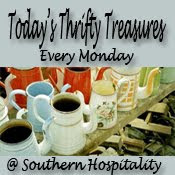 Nice thrifty finds and good tips. Looks like you found some cute outfits - at some good prices. I bet your kiddo will love the shoes! What cute outfits! I have boys, so shopping for them isn't quite as fun. Thanks for visiting me via Rhoda! I can't wait to read some more of your posts! Fantastic!! Our area doesn't have those great big consignments, but I did have fun today at our local store! I appreciate your candor and confession that you don't l-o-ve to sing the itsy bitsy spider over and over again either!! I think the laundry basket is a great idea and I've been known to push an empty stroller thru a flea market -- its genius! Omg what a sale. I think I would go nuts in a place like that. How fun!! Glad you scored the goods, girlfriend! Hey, Amanda, way to score on some fab kid's clothes & shoes. Those are great, thanks for joining the party, my friend. Holy Moly! That looks like an awesome sale. Great finds, too! Thanks for stopping by my blog. I'll be following you now! Sounds like a great way to buy kids clothes! I LOVE these sales. I recently bought and sold at our local spring one and it was great. But, you are so right. You must have a budget and know your prices! I laugh out loud when I see those overpriced dresses. I mean, really...what are they thinking? You got some really cute stuff for the girls....Score! Great tips! I have been holding a children's consignment sale for over fifteen years now and have loved the things that I can get at it and am so thrilled to have been able to offer bargains to the community. Consignment shopping is the way to go, in my opinion, if you are smart about it. I love the B/W saddle oxfords. I wore those suckers when I was a kid. You found some really cute things. We have a few of these monster sales around here too and my daughter goes to them. She keeps trying to talk me into selling at them so I appreciate the tips from you! You found some cute stuff! I found a LP dress at the thrift store for $2! Oh my goodness what great deals! Don't you just love a good bargain? Wait, where is your linky party. It's on Wednesday's right?